Looking to learn more about fencing? Have a group that what's to find out about this sport? 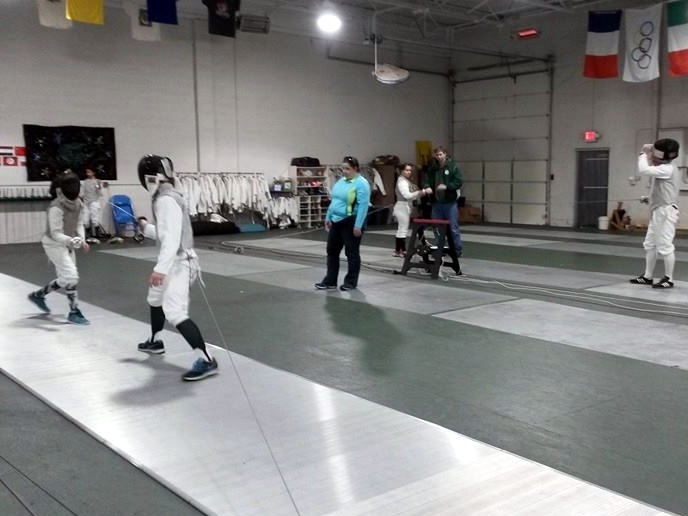 Salle d'Etroit can do fencing demos, either onsite here in our venue, or offsite at your location. Demos can range from a quick 20 minute talk about the history of fencing and the three main weapons in use today to a multi-hour group lesson where participants can fence each other in a mock bout. Groups can range in age from 5 to 99, we've got a program to fit your needs. If you are looking for something interesting to do for a birthday party, Salle d'Etroit can host your party. Any age, kids, teens, adults. We can tech your group to fence and fill an afternoon with fun activities. Call or e-mail for details and cost. 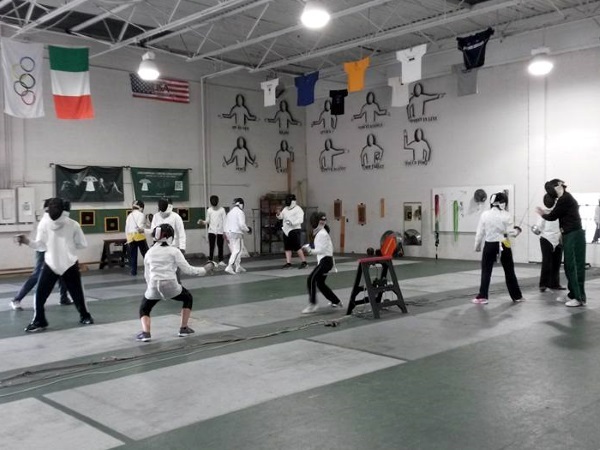 Salle d'Etroit offers fencing day camps at various times in June, July, and August. Cost is per week and students should bring a lunch and a water bottle. Drop off is at 9 AM and pickup is at 4 PM. What do we do at fencing camp? The better question is, what don't we do? Our Fencing Day Camp is for all kids ages 6-16 years old. We will play games, watch movies at lunch, and of course - FENCE! Each day we will focus on a different fencing weapon (foil, sabre or epee) and how it applies to the other two. Students will learn through a variety of games (such as Fencer Frisbee and Kingdom) as well as standard instruction. Students will also learn about fencing tournaments and have a chance to participate in an unofficial one. The last day we fence the Tri-Weapon Tournament - it's not just based on skill but also on luck! This camp is for all skill levels. Attention will be placed on the basics as well as advanced concepts for the more experienced fencer. Call or e-mail for current camp offerings. Salle d'Etroit can come to your venue and do a fencing demo. We have programs from 30 minute talks about the sport of fencing to 2 hour group lessons where we give your attendees the basics of fencing and let them try the equipment. We can accommodate younger kids 5 - 10 years, older kids 11 - 18, or adults of any age. The 30 minute talk is a basic history of fencing and a demonstration of the three weapons of fencing (foil, epee, and sabre) by our fencers. We include time for questions and answers as well as an interactive session where the audience gets to direct a fencing match. All demos start with the talk. The group fencing lessons will go through the basics of foot work and lunges. Time permitting, we can suit up participants and let them bout with each other in a controlled match with real foils or we can bring out the foam swords and have matches that require less protective equipment. The cost of demos varies on the time needed and the amount of equipment required. All programs can be modified to individual requirements. Call or e-mail for more information. 30 Minute talks are generally free to most groups if we can bring fliers and business cards to pass out. If there will be lessons, participants should wear long pants and sneakers and be fit enough for 20 minutes of sustained activity. Looking for a fun activity to do for your birthday? 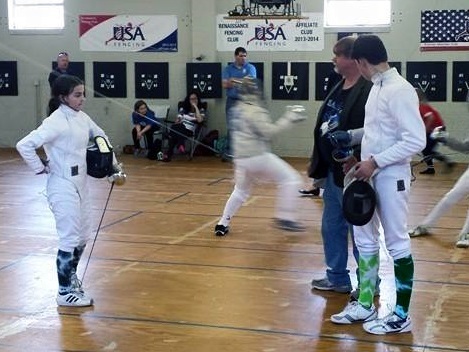 Salle d'Etroit offers in-house fencing lessons for groups of all sizes. We can accommodate younger kids 5 - 10 years, older kids 11 - 18, or adults of any age and any mix of ages. We'll start with a 20 to 30 minute talk covering the basic history of fencing with quick a demonstration of the three weapons of fencing (foil, epee, and sabre) by our fencers. Then we'll have a group fencing lesson that will go through the basics of foot work and lunges. Time permitting, we can suit up participants and let them bout with each other in a controlled match with real foils or we can bring out the foam swords and have matches that require less protective equipment. Participants will get the feel of competitive fencing. We can also offer "bunny fencing" where the combatants try to break the balloons (or bunny ears) off the mask of their opponent. The cost varies on the time needed and the amount of equipment required. All programs can be modified to individual requirements. Call or e-mail for more information.